After teasing the release of a 3-inch single from the Raconteurs back in January, Jack White's Third Man Records has revealed that its Record Store Day 2019 plans will feature an entire box set of the tiny records, in addition to an accompanying turntable. To mark the day of vinyl celebration on April 13, White's label will offer up a box set of six 3-inch records containing select singles from the White Stripes' back catalogue, in addition to four other Third Man singles in mystery sleeves. 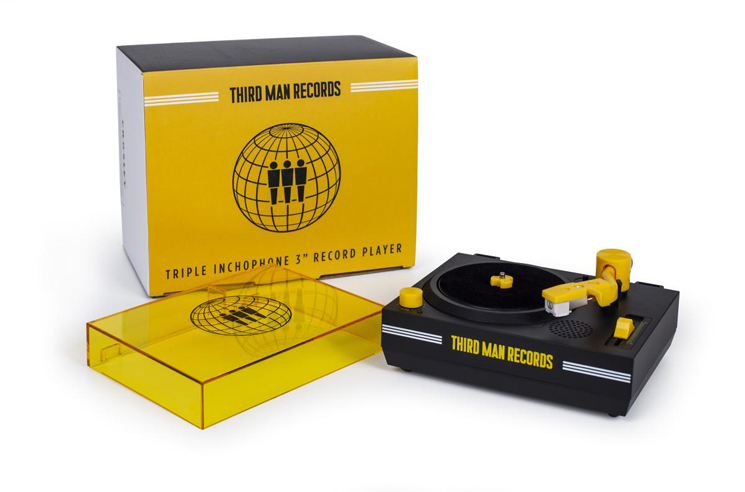 A new Third Man Records-branded "Triple Inchophone" turntable will also be available, as you can see above. The box set will contain White Stripes singles "Let's Shake Hands," "Lafayette Blues," "The Big Three Killed My Baby," "Hello Operator," "Lord, Send Me an Angel" and "Conquest." The mystery sleeve releases are the Raconteurs' "Store Bought Bones," the Dead Weather's "Be Still," White's "Love Interruption" and the White Stripes "Candy Cane Children." It's important to note that the White Stripes box set and the Triple Inchophone turntable will only be available at Third Man's Nashville and Detroit storefronts come Record Store Day, while the mystery singles will be available at participating RSD stores around the globe. As previously reported, White and his Third Man crew are no strangers to the tiny format. Back in 2005, the White Stripes released a red and white Triple Inchophone alongside 3-inch singles of "Top Special," "Hotel Yorba," "Blue Orchid," "Dead Leaves and the Dirty Ground," "The Hardest Button to Button," "Fell In Love With A Girl" and "Seven Nation Army." Those aforementioned tiny titles now go for large sums of cash on the second-hand market. Record Store Day 2019 is on April 13, and you can find the full list of exclusive releases over here. Pearl Jam have been named official Record Store Day ambassadors for this year's event. White recently launched a mastering facility under his Third Man umbrella, while the Raconteurs teased their first new music in a decade late last year.